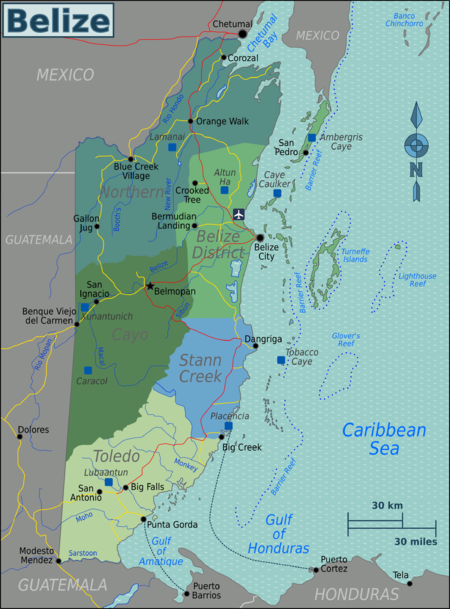 Belize, formerly the colony of British Honduras, is the only country in Central America without a coastline on the Pacific Ocean (only the Caribbean Sea to its east), and the only one in the region with English as its official language. The country is located between Guatemala to the west and south and Mexico to the north. With a long Caribbean coast, Belize is a culturally diverse and mixed race country with one foot in Latin America and the other in the Caribbean. There is the creole/ (Afro-European mixture) population as well as the native Maya people and the Mestizos that tend to live in the north and northwest of the country Spanish is often spoken. In the south east along the Caribbean coast live the Garifuna (Black Caribs) an Afro-Amerindian culture. German speaking Mennonites also call Belize home. In addition, there are people of East Indian, and Lebanese decent. World class attractions include exploring the lush jungles with exotic plants and animals, deep sea fishing, swimming, snorkeling and diving in the Caribbean sea with its attractive reefs, and visiting the Mayan ruins. Income levels are still very low and the infrastructure is very basic. The Belizeans are very proud and friendly to visitors and the tourist industry grew greatly in the last decade. As in the neighboring parts of Guatemala and Mexico, this area was settled for thousands of years by the Mayan people. They are still here, an important part of Belize's people and culture. While the Spanish Empire claimed the area in the 16th century, the Spanish made little progress in settling here. The British settled first on the coast and offshore islands for logging. In 1798 British Belizean forces defeated a Spanish attempt to drive them out in "the Battle of St. George's Caye", whose anniversary is still celebrated as a holiday each 10 September. The colony of "British Honduras" grew in the 19th century. At first Africans were brought in as slaves, but slavery was abolished here in 1838. Many refugees from the 19th century Caste War of Yucatan escaped the conflict to settle in Belize, especially the northern section. The government of Guatemala long claimed to have inherited the Spanish claim to Belize; the territorial dispute delayed the independence of Belize until 1981. Guatemala refused to recognize the new nation until 1991. Belize escaped the bloody civil conflicts of the 1980s that engulfed much of Central America, and refugees from the conflict in Guatemala arrived, mostly settling in the west. While Belize has not been immune to the rampant drug crime and grinding poverty of its neighbors it is a comparatively safe destination in a conflict prone part of the world. Tourism has become the mainstay of the economy as the old agricultural products -- sugar, banana, and oranges -- have lost ground. The country remains plagued by high unemployment, growing involvement in the South American drug trade, and increased urban crime. In 2006 commercial quantity oil was discovered in the Spanish Lookout area. Tropical; very hot and thick; rainy season (May to November); dry season (February to May). Hurricanes season (June to November) brings coastal flooding (especially in south). All visitors are required to have sufficient funds, US$75 per day, and documents required for their next destination. Warning: If entering by land from Mexico, you will be charged a fee of $533 Mexican pesos (as of May 2018) by Mexican immigration unless you can show proof that you paid the immigration fee when you entered Mexico. Your FMM tourist card is not enough. If you crossed at a land border, you'll need the actual receipt from when you paid the fee. If you reached Mexico via a commercial flight, you've may have already paid the fee with your airfare, but the border guards here do not care. You might be able to convince them if you have a print-out of an itemized receipt from the airline showing that this specific fee was included. Nationals who hold passports or refugee documents from all European Union member states, Andorra, Antigua and Barbuda, Argentina, Australia, the Bahamas, Barbados, Bolivia, Botswana, Brazil, Brunei, Canada, Chile, Colombia, Costa Rica, Dominica, the Dominican Republic, Ecuador, El Salvador, Fiji, the Gambia, Ghana, Grenada, Guatemala, Guyana, Honduras, Hong Kong, Iceland, Israel, Jamaica, Japan, Kiribati, Lesotho, Liechtenstein, Malawi, Malaysia, Maldives, Marshall Islands, Mauritius, Mexico, Micronesia, Monaco, Morocco, Namibia, Nauru, New Zealand, Nicaragua, Norway, Palau, Panama, Papua New Guinea, Samoa, Saint Kitts and Nevis, Saint Lucia, Saint Vincent and the Grenadines, Seychelles, Sierra Leone, Singapore, Solomon Islands, South Africa, South Korea, Suriname, Swaziland, Sweden, Switzerland, Taiwan, Tanzania, Tonga, Trinidad and Tobago, Tunisia, Turkey, Tuvalu, Uganda, United States, Uruguay, Vanuatu, Vatican City, Venezuela, Zambia and Zimbabwe, in addition to passports issued to British Overseas Territories citizens, do not require a visa to visit Belize. All foreign nationals with a valid visa for the Schengen Area are visa exempt for a maximum stay of 90 days. Permanent residents and holders of multiple entry visas of the United States may obtain a visa on arrival for a fee of US$50. All other travellers not falling into the above categories require a visa prior to travel, which can be obtained in a Belizean or British embassy. Nationals of Afghanistan, Algeria, Bangladesh, Bolivia, China, Cuba, Eritrea, Haiti, India, Iran, Iraq, Kenya, North Korea, Lebanon, Libya, Myanmar, Nepal, Nigeria, Pakistan, Palestine, Sri Lanka, Somalia, Sudan, Syria and Thailand require clearance in addition to a visa. Nationals of China (PRC) must pay a repatriation fee of BZ$3,000 on arrival. Nationals of Bangladesh, India, Pakistan and Sri Lanka must pay a repatriation fee of BZ$1,200 on arrival. The Belize Tourism Board  maintains up-to-date information. When leaving country by land, prepare to pay taxes (mandatory BZD$30 or USD$15 border fee per person plus a BZD$7.50 or USD$3.75 PACT fee per person if stay exceeded 24 hours (As of April 2016)) in cash, if paying in USD then you may or may not receive change in BZD. The Philip S. W. Goldson International Airport (IATA: BZE) (ICAO: MZBZ) is in Ladyville, to the northwest of Belize City where it receives international direct flights from Atlanta, Charlotte, Newark, Miami, Dallas, Houston, Flores, San Salvador, Roatan and San Pedro Sula. Buses from Belize City and Belmopan operate to Flores in Guatemala, and to Chetumal in Mexico. There is also an ADO express bus that goes all the way from Cancun to Belize City and back once a day. To Puerto Cortés, Honduras, the Gulf Cruza, a small rickety speed boat (20 people) leaves Placencia each Friday at around 9:30AM (4h US$50), going first to Big Creek. It returns to Placencia on Monday. Tickets are sold in the tourist office next to the gas station. Stop by immigration first. Small speedboats operate on a daily basis between Puerto Barrios in Guatemala to Punta Gorda, cost is around US$20 one way. On Tuesday and Fridays, boats operate from Livingston in Guatemala to Punta Gorda. The ride take no more than 1 hour. Its B$50. There is also a B$30 departure tax plus B$7.50 marine park fee. Foreigners are required to pay departure taxes and a conservation upkeep fee when leaving Belize via land, air, or water. These fees are only applicable to locals when flying. To travel between Belize City and the islands (Caye Caulker, San Pedro) and even Chetumal, Mexico, you can travel by water taxi. San Pedro Belize Express is the best choice for reliable schedules and trained staff. The water taxi is reliable, safe, and departs often. You can catch the water taxi in Belize City at Brown Sugar Terminal near the tourist village. For more information about departure times, you can check out the water taxi site online at the Belize Water Taxi website. . This site provides the time tables, and further information about travel. Belize is a fairly small country, and transportation between most destinations is rarely long and tedious. Tropic Air  and Maya Island Air  both have multiple flights daily to various towns around the country and to Ambergris Caye and Caye Caulker. They fly out of both of Belize City's airports, but flights from Belize City Airport (IATA: TZA) are often significantly cheaper than those out of Phillip Goldson International (IATA: BZE). Domestic flights are generally pretty reasonable, and thus popular if your time is limited and budget is not. Flights are operated with planes ranging from 8 to 68 seats. Because of the limited capacity, booking in advance is advisable. For bookings from outside Belize, there is only one internet agent, airviva , who can make bookings, take payment (credit/debit cards/Paypal) and then send e-tickets. Some hotels do also offer to make the flight reservation on your behalf. Flights to Caye Caulker airport resumed in September 2018 after being suspended due to construction. Several competing buslines operate on the main road in the north-south direction from Punta Gorda to Belmopan and Belize City. There are bus stations in the main towns, or simply stand on the side of the highway and wave at an approaching bus. Most buses have a conductor in addition to the driver, who stands by the door and will come to your seat to collect the fare at some point during the trip. Fares run anywhere from BZ$2-25 depending on distance traveled. Express buses can save up to an hour and a half (depending on the distance of your trip); they do not stop for passengers waiting on the roadside, making only scheduled pick-ups and drop-offs in towns. Most buses in Belize are retired US school buses (Bluebirds), that have been given a slight makeover, a luggage rack installed, and sometimes a new paint job. They generally aren't too crowded, but you may have to stand occasionally. Children selling snacks and soft drinks often board the buses at stops, and this is an inexpensive way to have a snack if you've exhausted what you've brought along or just want to try some home-made travel foods. For those wanting a truly Belizean experience, take the water taxis from city to city. The San Pedro Belize Express  has the most daily runs and departs from the Brown Sugar Terminal in Belize City at 9AM, 11AM, 12:00 noon, 1PM, 3PM, 4PM and 5:30PM to San Pedro and Caye Caulker. Departure from San Pedro Town pier on Black Coral Street next to Wahoo's Bar and Grill and leaves at 7AM, 8:30AM, 10AM, 11:30AM, 12:30PM, 2:30PM, 4:30PM to Caye Caulker and Belize City as well as a last boat to Caye Caulker only at 6PM. There are boats departing from Caye Caulker to both Belize City and San Pedro Town and they leave from the pier in front of the Basket Ball Court. Caye Caulker to Belize City: 7:30AM, 9AM, 10:30AM, 12:00 noon, 1PM, 3PM, 5PM and Caye Caulker to San Pedro: 7AM (Connection to Chetumal), 9:45AM, 11:45PM, 12:45AM, 1:45PM, 3:45PM, 4:45PM and last boat 6:15PM. Chetumal Runs are available from Caye Caulker at 7AM and from San Pedro at 7:30AM. Traveling from Chetumal to Belize, the boat leaves the Municipal Pier at 3:30PM en route to San Pedro (90 min) and Caye Caulker (120 min). Of course, if you like to make your own itinerary when traveling around Belize, car rental is an option. There are several car rental companies based at the Philip S.W. Goldson Airport (BZE), including major international companies (e.g. Hertz, Avis, Thrifty) as well as local companies (e.g. Pancho's, Crystal, AQ's Car Rental, Ron's Belize Shuttle Service). Several companies also have rental offices located in Belize City proper. Car hire will run upwards of $80/day, even during the low season. Be aware that many rental cars in Belize have manual transmissions, although cars with automatic transmissions are not too difficult to come by. The roads are bumpy, so a four wheel drive is recommended, especially if you plan to drive on minor roads. Driving is on the right-hand side of the road. Drivers can pass slower vehicles on the left, being very careful to check for on-coming traffic before making a pass. Lighting on minor roads is not great so stick to highways or day time driving. The main highways through Belize are: the Northern Highway, beginning at the Mexican border; the Western Highway, from Belize City to the Guatemala border; and the Hummingbird Highway, which takes you to southern Belize. These highways will take you almost anywhere you need to go and are relatively well-maintained. And although they are not marked well (i.e. no mile/kilometer markers or town signs), the road system is relatively simple to navigate and it's easy to know where you are. The Hummingbird Highway is the oldest, and roughest of the paved highways, and you will often experience potholes and stretches of gravel. The newest paved road is the Placencia turn-off, which is smooth and very well-marked all the way to the southernmost tip of the Placencia Peninsula. Always use caution when entering the vicinity of towns and villages, because Belizean roads are notorious for steep speed bumps. AQ Belize Car Rental is Belize Premier economy Auto Rental company, with free local pick up, with 24 hour roadside assistance. Belize Ground Shuttle Top rated shuttle provider offering daily service to the airport and all major destinations in Belize. Ron's Shuttle Private Transfers between all major destinations in Belize. Belize International Airport Shuttle Service an easy way of getting to and from The International Airport, Shuttle can be done on your time. Shuttle is Reliable and on-time for transfer at Any Resort or Hotel. Belize Airport Shuttle Service providing shared and private shuttle service from the Philip Goldson International Airport (PGIA) to major destinations like San Ignacio, Hopkins, and Dangriga. Also to distant resort like Black Rock Lodge, Chaa Creek, Belize Ocean Club and more. Taxis can be a very good way to explore the local area you are staying in - although long distance trips can get expensive. Ask your accommodation, or someone you trust to put you in contact with a reliable driver. Always agree on a price before you get into the taxi. Taxi's normally have green number plates that start with a "D". As a former British colony the official language of Belize is English, which makes it stand out from its Spanish speaking neighbours. Nevertheless, Spanish is spoken fluently by around 60% of the population. Belizean Creole (or Kriol), Mayan languages, Garifuna (Carib) and, to a lesser extent, various dialects of German are widely spoken in various parts of the country. Belizean Creole is an English-based creole language closely related to Jamaican Patois. Many Belizeans speak a mix of Creole and English among friends, and full English to foreigners. The strong Caribbean accent may take some getting used to. Some Belizeans will code-switch (change languages mid-sentence without realising) between English and Creole. As Creole and English sound similar, this can cause some confusion to the listener who doesn't understand why they suddenly can't understand when everything was making sense a minute ago. Drawing the speaker's attention to the fact that you haven't understood will usually result in some laughter and a switch back to English. Belizeans place a strong emphasis on the 'o' sound in the word 'two'. Some English accents (particularly Australian's) may find that their pronunciation of the word 'two' is heard as 'three'. Holding up two fingers, emphasising the 'ooo' sound and watching to see that sales attendants have understood correctly can help mitigate this confusion. A great deal of confusion amongst travellers has resulted from Belizeans love of the phrase 'right now'. Contrary to most other English speaking countries, in Belize 'right now' does not mean 'immediately' but rather 'soon' or 'in a minute'. Many of the Maya ruins (listed below) can be visited in person. 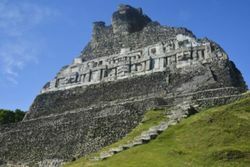 Unlike most ruins, many of those in Belize can still be climbed and explored by foot. Altun Ha (Northern Belize) - Two large central plazas and mid-size pyramids are exposed. This is the most easily-accessible site from Belize City. Lamanai (Northern Belize) - Three large pyramids and stelae, residential areas, plazas, a unique ball court. Xunantunich (Western Belize) - Very well-excavated carving stelae and an impressive main pyramid. Can drive right up to this site. Access it by crossing the Mopan River aboard a tiny hand-cranked car-ferry in the village of San José Succotz (only about 10 minutes west of San Ignacio on the Western Highway). El Pilar (Western Belize) - 100-acre site with 25+ plazas, on the Belize-Guatemala border. Caracol (Western Belize) - Largest known Maya site in Belize, but not as well-excavated as others. Main pyramid (Caana, or "Sky Palace") is the tallest Maya structure in Belize. Actun Tunichil Muknal (ATM) Cave (Western Belize) - This is not a Maya structure, but a cave that contains Maya skeletons, ceramics, and stoneware. Xunantunich, Caracol, and ATM Cave are all very easily accessible from San Ignacio, either self-drive or on a guided tour. San Ignacio is also a launching point for visiting Tikal. Most hotels in San Ignacio will arrange tours of the nearby sites and Tikal for guests. You can also arrange tours through any of the tour companies whose offices can be found in the central part of San Ignacio (on or around the pedestrian stretch of Burns Avenue). Tours to the ruins can also be arranged for visitors staying in the Cayes. On Caye Caulker and in San Pedro, you will find tour companies that can arrange tours of some of the Maya sites. 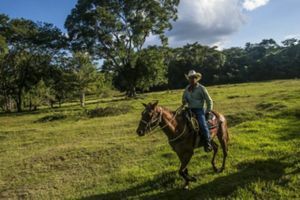 Come ride with a Belizean cowboy! When traveling inland to San Ignacio, there are lots of opportunities to explore the jungles by horseback. Old Belize is a landmark attraction, offering a total Belize experience for locals and tourists. At its heart is the Old Belize Exhibit, a stirring cultural and historical display that takes visitors back in time to various defining segments of Belize’s past. The display contains many authentic relics from key periods, a haunting introductory teaser to the Mayan legacy in Belize, an eerie depiction of the Belize City of Colonial days, and an intimate glimpse into 18th century logging camps, and more. Old Belize also features Cucumber Beach (the only beach in Belize City), the Old Belize Marina, a full service restaurant, plus conference facilities and banquet hall. Old Belize is located at Mile 5 on the Western Highway, a $10 US cab ride from the Tourist Village, Brown Sugar Terminal, downtown Belize City, and most central locations in Belize City. Soar over Belize's rain forest by taking a Zip-line tour. These tours usually begin with a short hike up to the first base where a tutorial is given on how to safely use your equipment. Costs range from $95USD to $100USD and tours are run by two companies, Jaguar Paw, and Back-A-Bush tours. Sportfishing in Belize is second to none. The bonefish is the premier fly fishing game fish in the world and it can be found in the grass shallows through Belize. It's pound for pound perhaps the strongest animal in salt-water. Also world-class is the snorkeling and scuba diving. There are many exceptional dive sites to be found in Belize. One of the best ways to explore Belize waters is by chartering a sailboat or catamaran \to make the most of your available dive time. For those with a smaller budget, snorkeling and driving excursions can be found along the beaches of Ambergris Caye and Caye Caulker. The most common excursions will take you to both Hol Chan marine reserve and Shark Ray Alley. These trips usually cost about $35USD and includes snorkel gear. Be mindful of an additional $10BZ charged to Foreigners as a park tax. This money goes toward the upkeep, and protection of the reef. Diving excursions are also offered to the Blue hole, but expect to pay a lot more for the privilege. The Cayo district is characterized by limestone hills underlain by a network of underground rivers, caves and sinkholes. The caves are magnificent, with huge caverns and tight passages, underground waterfalls and dazzling arrays of mineral-encrusted stalactites and stalagmites. This underground world was sacred to the ancient Maya and many artifacts from decorated pots to human remains are still intact in the caves. It is dangerous (and illegal) to enter the caves without a licensed guide. Most guides are trained in both the geology and mythology of the caves as well as in modern first aid and cave rescue techniques. Belize's greatest attraction Actun Tunichil Muknal, these spectacular caves combine adventure caving with amazing history. Traverse the cave system and river with a guide to see the calcified Mayan sacrifice remains at the end. Don't be afraid of getting wet. The Belize dollar (BZD, usually symbolized with a "$") is officially worth exactly 1/2 of a U.S. dollar. Because of this simple and consistent exchange rate, U.S. dollars are widely accepted, but this means you should be careful to clarify which "dollars" you're talking about when negotiating prices. It's often better to assume Belize dollars because many merchants will jump on your uncertainty and attempt to double their price by saying "No, in US Dollars". Belize dollars come in denominations of $2, $5, $10, $20, $50, and $100; $1 and smaller amounts are coins. The 25-cent coin is often called a "shilling". Rice and Beans is a mixed dish with some spices, onion and usually coconut milk added to make a sweet and hot staple of the Belizean diet. Beans and Rice is white cooked rice with a side of stewed red beans. A famous hot sauce in Belize is Marie Sharp's made from the very potent local habanero pepper. It comes in a variety of flavors (mild, hot, extremely hot). Falmaau (or Séré) is coconut milk with fish. Normally made with grouper. Very delicious. Hodut is plantains mashed, using a mortar until it is a dumpling like consistency. It is often eaten piece by piece with Falmaau. Dukunu is mashed corn pudding. Garnaches are tostadas topped with beans and cheese. Panades are fried empanadas made with corn flour and filled with fish, shark or beans. Belikin is the national beer and comes in four varieties: Belikin Premium, Belikin Beer, Belikin Stout, and Lighthouse Lager. Guinness Stout is also available in Belize but it is brewed by the Belikin Brewing Co. All are sold in returnable bottles, so make sure you are aware of the deposit if you are taking your beverages to go. One Barrel Rum is the locally-distilled molasses-tasting rum. Travelers Rum has a distillary on the Northern Highway about 6 miles from Belize City with a gift shop and hospitality bar. You can purchase rum in a variety of colors and sizes, up to a 70 gallon cask. Both are widely available around the country. But if you also like wine there is cashew wine (which is very popular in Belize), ginger wine, sorrel wine and blackberry wine. There are great opportunities for beginning and experienced scuba divers to have underwater adventures at the Belize atolls. San Pedro/Ambergris Caye is the center of Belize diving and Belize most popular destination. The best diving will be on the atolls. Caye Caulker is much smaller but also a popular dive destination. Placencia is popular for diving but it is 20 miles from the reef. Organic crops are available for purchase and consumption all around Belize, especially at Farmer's Markets. If you have ever wanted to get insight into organic farming techniques, San Lorenzo Farm in San Ignacio is a great place to learn, participate, and indulge in some homegrown organic foods. Go visit for a half day, or spend the night as part of an eco-farm stay. To learn about Belize's rich history, the Museum of Belize is a great resource. Violent gang related crime sometimes occurs in Belize City and surrounding areas. The violence is related to narcotic trafficking and the struggle for power in the streets. Exercise caution, avoid areas that have obvious amounts of poverty or crime, and Belize can be a very safe and rewarding country. Belize City is the most dangerous city in Belize, although it's very easy to be safe there. Remain in the tourist zone that runs just north of the marina to the southern extension to the east of the main canal. There are plenty of khaki tourist police monitoring the area, and should you have a problem, feel free to approach them. Be sure to know the police officer. Belize City is known for corrupt police officers. Just exercise common sense and do not go wandering around alone after dark. Stay near tourist areas or other commercial zones. Other areas of Belize are generally safe as well, but like in other places on the world, one should practice skepticism when dealing with strangers. Most are genuinely helpful, but it never hurts to be cautious. Belize City south side is beautiful as well as dangerous. Otherwise, Belize City is a great place to go if you want to eat, learn or shop. Belize is a relatively healthy country. Bottled water is a must in most areas. And, unless you eat only at tourist restaurants, dysentery may strike at some point; be prepared with over-the-counter medication and prescription antibiotics as some drugs may be hard to find in Belize (particularly outside the major cities). The CDC lists all of Belize except Belize City as a malaria risk area, and recommends the antimalarial drug chloroquine. Other drugs may also be recommended in certain circumstances - consult a qualified professional specialist. Dengue Fever is also a risk in many parts of Belize. Dengue Fever is carried by mosquitoes. Some common medications can increase the risks associated with Dengue Fever, therefore if Dengue Fever is suspected, seek prompt medical advice. Insect/mosquito bites should be prevented with appropriate clothing, repellents and insecticides, and bed nets if sleeping in non-air-con/unscreened rooms. The sun, as anywhere else in the tropics, is very intense. A hat, high-SPF sunscreen, and sunglasses will serve you well. Many places in Belize are very hot and humid, and dehydration is a risk. An expat suggests to drink as much water as you want, and then drink that much again. The adult HIV/AIDS prevalence rate is currently at 2.5% or 1 per 40 adults. The standard of healthcare is generally poor. So if traveling be sure to buy an insurance policy that includes evacuation in the event of a medical emergency. Belizeans are some of the most socially relaxed people in the world, especially if you venture inland away from the tourist islands of Ambergris Caye and Caye Caulker. The pace of life is generally slower in Belize, so it's good practice to begin any social interaction, even to ask a quick question, with eye contact and a genuinely pleasant greeting. Most rural Belizeans enjoy casual conversation and you could easily find yourself chatting it up for a few hours. Hey, it's part of the charm! The Maya communities can be a little more reserved at times. As always, a little respect and politeness will carry you through. In professional settings Belizeans can be very formal and will refer to their colleagues and associates as Miss/Mr (Mrs and Ms are rarely used, most married women will be called Miss). Where there is some familiarity the person may be refereed to by their title and first name (eg. Miss Julie, instead of Miss Johnston). The terms "boy" and "girl" ("bwai" and "gyal" in Kriol) are considered highly offensive in many countries, particularly if applied to an adult or a person of African descent. This is not true in Belize where the terms are usually intended in a friendly manner. Whilst travelers unfamiliar with Belizean culture would be ill-advised to use these terms, they should also be aware that they are widely accepted and being called "boy" or "girl" is not considered offensive by Belizeans. You may also hear women called 'Mammy'. This is a very informal and generally a friendly term used when the speaker doesn't know the woman's name. Many Belizeans are very religious, with the various Christian religions being the most common. Visitors should be mindful that opinions and ideas which are inconsistent with religious organizations may cause offense. Sundays are considered an important time for relaxation. Most businesses will close on Sundays and many Belizeans will stay home for the day, or leave only for church. Even social events are likely to be low-key. Payphones are the most common public phones in the country, and accept pre-purchased phone cards. It is also possible to buy a pay-as-you-go SIM card through Digicell for any unlocked phone, 4G is now available in Belize, even though there's large pockets of land without signal. Internet cafes can be found in larger tourist areas, but are infrequent in rural areas. Skype is now available to use within Belize.